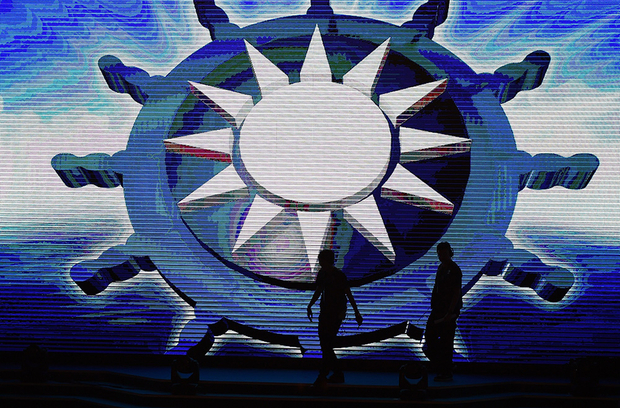 Two staff members of the ruling Kuomintang (KMT) party walk past a screen showing the party logo during the KMT’s party congress in Taipei on July 19, 2015. In 2008, when Lin was a university student, he had plenty of company in his idolization of KMT presidential candidate Ma Ying-jeou. Ma was elected, and re-elected four years later, with a large margin of votes. The last several years have brought drastic change in public support for both Ma and his party. Opinion polls in Taiwan vary quite broadly, but one recent think tank survey reports that 25.9 percent of those who voted for Ma in 2012 will be voting for Tsai Ing-wen of the DPP in 2016. Mickey Lin, a graduate student at National Taiwan University, is one of them. She cast her very first vote, for President Ma, four years ago. “My parents are schoolteachers,” she explained. Teachers, the military, and civil servants have been a traditional base of KMT support since the party’s days of running the state exclusively. To “blue” families like hers, Mickey added, the KMT stood for stability, and for the steady hand of a well-educated elite. “They think the DPP is a mob—that they have low education levels and tend to be from the south of Taiwan; it’s a kind of stereotype.” (The KMT is historically associated with the Mandarin-speaking mainland Chinese officials who relocated to Taiwan after losing the Civil War to the Communists in 1949, while the DPP—founded on the eve of democratization in 1986—is still tied in many people’s minds with the local Taiwanese-speaking grassroots movements that provided many of its members.) For Mickey, it was an incident in late March 2012, less than three months after she voted for Ma, that sparked a reconsideration of her support for the KMT. The forced demolition of a family home in Taipei’s Shilin District, whose owners resisted a government-backed urban renewal project, sparked demonstrations. Mickey was shocked by videos posted by friends on Facebook of police roughly handling protesters at the scene, and was inspired to participate in her first street protest. “I didn’t know the police would be so violent with social movement participants,” Mickey said. “I thought that kind of thing only happened in China; in Taiwan, we’re a democratic country.” She began to associate the current KMT, then, with the regime that had repressed generations of dissidents. This time, she told me, she will be voting for Tsai Ing-wen for president, and the small green camp Social Democratic Party for legislature. The Kuomintang, founded by Sun Yat-sen in 1912, is rooted in a Chinese revolutionary alliance that overthrew the Qing Dynasty and established the Republic of China. Since then, it has changed drastically and repeatedly. In its capacity as the government of the Republic of China, it took over Taiwan after defeat in World War II forced Japan to give up the colony it had wrested from the Qing 50 years earlier. But authoritarian KMT rule on the island has left a series of painful memories here: the February 28 Incident of 1947 (a brutally suppressed uprising that resulted in thousands, perhaps tens of thousands, of deaths) and the period of political repression called the White Terror that followed. After defeat by the Communists in the Chinese civil war, the Kuomintang government relocated to Taiwan, where it continued to look back across the straits to China and to the hope of eventual reunification under its rule. But as it became clear that the Republic would not replace the People’s Republic of China and as the KMT entered the competitive fray of democratic elections, its rhetoric shifted. It is now a party that prefers to emphasize stability in cross-strait relations rather than call for reunification. Its transition from the establishment party of Mandarin-speaking mandarins from the mainland to a localized party has led to defection from both those who consider it too close to China and those who wish it were closer still. James Soong is one example of the danger to the KMT when its members break away: a former KMT government official, he is running for president as a candidate for the People First Party, and in doing so, he is taking votes that might otherwise have gone to the KMT candidate, Eric Chu. When Soong ran against a KMT candidate in the 2000 presidential elections, it resulted in the election of the country’s first DPP president, Chen Shui-bian. The KMT’s current predicament stems from a mixture of challenges: the baggage of its history, including massive and controversial party assets; a wave of young people like Mickey Lin whose participation in social movements have caused them to regard the party critically; suspicion about the benefit to Taiwanese of recent cross-strait agreements; the splintering off of other blue-camp parties that take its votes; and public discontent with rising inequality and housing prices under President Ma Ying-jeou. (One middle-aged KMT voter told me that she was too disappointed with the economy under Ma, too unconvinced of Soong’s merit, and too distrustful of Tsai Ing-wen’s cross-strait policies to vote for any of them; she will probably stay away from the voting booth, and she is not alone.) Younger KMT workers also speak of a party that is too bureaucratic and conservative; it is slow, they complain, to send young people out–as the DPP and other parties have done—to speak for their party on television or to run for it in elections. But perhaps the KMT’s most existential challenge, which the election has thrown into sharp relief, is continuing disagreement within the party over relations with China. Eric Chu’s candidacy is a product of this problem: just three months ago he replaced Hung Hsiu-chu, whose explicitly pro-reunification stance alienated too many mainstream voters to make her viable. Meanwhile, the younger generation of KMT members like Lin Yu-hsiang refer quite naturally to Taiwan as “an island nation”; their support for the KMT comes in part from the belief that its emphasis on cooperative relations will allow Taiwan space to preserve its own way of life. Chin Da-chun, a 26-year-old KMT city councilor’s assistant, tells me at first that reunification is in the constitution, but when I ask him whether he supports it, he smiles and shakes his head. “The older generation definitely does. But times have changed. It’s a family across the straits, sure—but it’s like the father has died, and there are two brothers, and each want to establish their own households.” Even Eric Huang, the young head of the KMT International Affairs Department and a spokesperson for Eric Chu’s presidential campaign, spoke of being of the generation known as ziran du—“naturally independent”—for their unselfconsciously Taiwan-centered identities. It is a view far removed from that of the party that claimed to be the legitimate government of all of China. The KMT and the DPP are local parties and both speak in terms of how to help the island maintain its current way of life: one in which it has a de facto say over its own affairs, if not the name of country. “Our policy with regards to cross-strait…relations is, we’re practical. We do what we have to do to survive,” Huang told me. Ranged against these mainstream views are people like Wang Ping-chung, a 28-year-old legislator-at-large candidate with the New Party—another blue-camp party founded by former members of the KMT. Wang, a flamboyant character who likes to wear tangzhuang—a modern take on traditional Chinese clothing—has traveled to China with Taiwanese delegations and met Xi Jinping twice. “I never completely identified with the KMT,” he told me. “The reason was that the KMT never dared to speak out and say what their opinion was. For example, ‘I advocate eventual reunification’…they don’t dare to say it. The Chinese Nationalist Party ”—the full name of the KMT—“is Chinese, but if you ask them, ‘Are you Chinese?’ they don’t dare answer.” The most important thing in politics, Wang added forcefully, “is you’ve got to have a position. As I saw it, the KMT became too coward.” For emphasis, he puts the last word in English.